This year I took it upon myself to do a lot of New Year baking. Usually we just buy those incredibly delicious salty-sweet yam cookies, but I found a recipe for little almond cookies in Delicious magazine, and I thought that they would be a good alternative. And as I have said previously, I wanted there to be a huge sense of fullness and abundance going through the house on the special day, so I did a LOT of baking on Monday - muesli, granola and these cookies. I was pooped! 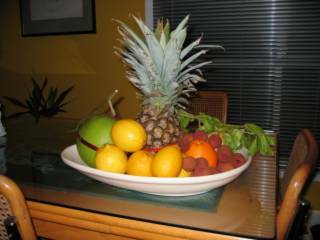 Also, we bought loads of fruits (peaches, oranges, lemons, lychees, a pomegranate...) and had them displayed around the kitchen. In my Living Kitchen Platter too! Here is a picture of the little almond cookies. The recipe says it will make about 40, I think, but I got 67 out of the mixture. I actually measured them individually with a teaspoon - so they were all exactly the same size. They were gorgeous, like little coins! Go symbolism! 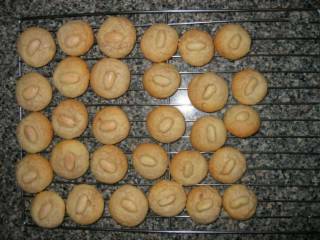 Little Almond Cookies (Jill Dupleix) - almond on the left, peanut on the right. I also did cashew ones. I wouldn't say that the biscuits were especially good (even though my family and friends seemed to love them), but they were definitely compulsive. Just like Pringles - you know, "Once you pop, you can't stop" and all that. They're not crunchy, just chewy, and with a hint of spiciness thanks to a touch of both cinnamon and ginger. Dad: After dinner Come on Daniel, have a cookie! Daniel: I would, but I already had six today! Kate: They've got this spicy taste in them that makes them really good. In all honesty, they're super fun to make... but not the best biscuits. If it were up to me, I wouldn't make them again. I miss the yam cookies!! I'd probably make these for my family next year and also buy a pack of yam cookies. Which celebrity chef are you? Whatcha been up to lately? More Living Kitchen Products have arrived! I am Pistachio-Woman, hear me roar!